We're wishing all our fans a Happy Valentine's Day! Your love for plaster casts and art keeps us going, and we thank you for that. We thought we'd share the above photo on the day of love, even though we took it last summer. One of us brought in hydrangeas from the garden to give to everyone here (so sweet! 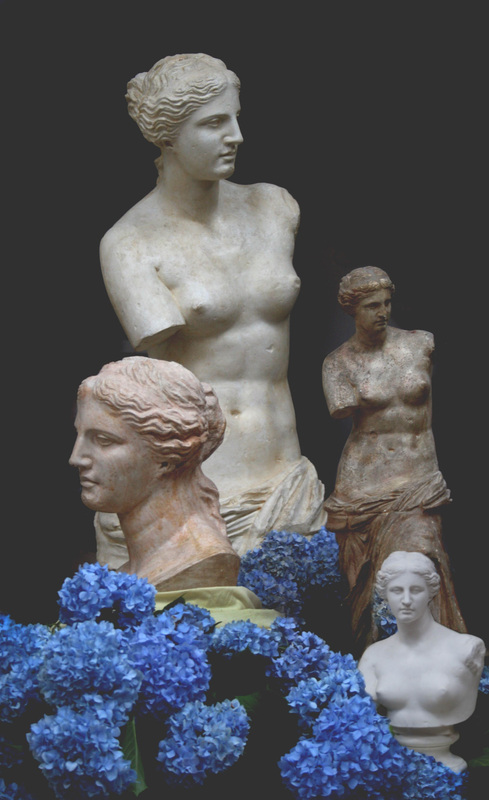 ), and a few of us improvised a spontaneous photo shoot of the blue flowers and the Venus de Melo pieces in our collection! We had a great time arranging the pieces and flowers, with wonderful results. In total, we have five pieces although only four are pictured above. We offer the full-size sculpture as well as a 34-inch-high reduction and a 12-inch-high reduction. Then there is the full-size head and a small bust. For more great content inspired by Valentine's Day sculpture gifts and decorations, head over to the poem we wrote on our blog last year! Please note: Sources used can be found on the corresponding product pages. Hi Christopher, Feel free to send us an email to discuss wholesale pricing. Do u offer wholesale pricing?